Fox & Friends is not the only Fox News venue smearing NBC's telethon to benefit Sandy victims. Fox Nation has gotten into the act, too. And while pointing the finger of bias at NBC, Fox somehow "forgot" about how, just a few days earlier, Mitt Romney canceled his Ohio political rally and, instead, threw an impromptu “hurricane relief rally,” at the same location, with the same people, during which he played a biographical film from the convention to, lets say help Hurricane Sandy’s victims. In one swift swoop, Fox has suggested not only that the event is partisan merely because its participants hold political views (which raises the question of how Fox feels about its own integrity given that over 30 of its employees openly campaign for Republicans) and that NBC and all its related networks are in the can for Obama because they haven't "guaranteed" otherwise to the MRC's satisfaction. Well played, Fox. Across the Twitterverse, some proclaimed that NBC was “hosting an Obama rally,” others tweeted that they “bet this becomes a thing for Obama” and urged potential viewers to “boycott” the event. That’s right, an unknown number of tweets by unnamed people is what passes for credibility here. 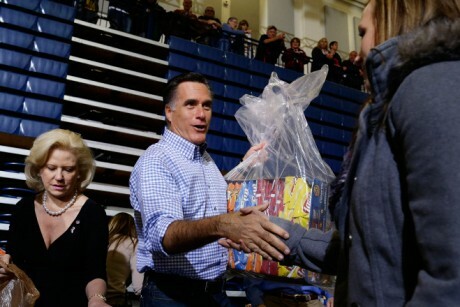 The irony of Mitt Romney’s earlier political rally cloaked in charity work, seemed to escape Fox. 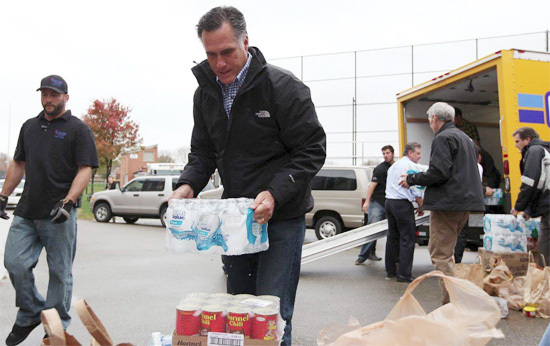 The photo-op nature of it, with Mitt himself stacking cans gets no mention here. To tie this all in to a critique of the left having a double standard (which is a delighful bit of irony coming from Fox) was a mention of Katrina. The article opines that the last NBC hurricane rally, though it “raised $50 million for the Red Cross” unfortunately had some “politcally flavored content.” Meaning Kanye West's famous criticism of George Bush during that event which made host Mike Myers look extremely uncomfortable. In order to fully link the two benefits, Fox Nation reminds us that “sources close to Friday night’s show tell Foxnews.com that West has been approached to appear as a special guest." Cue racial resentment, liberal media bias rage, and a subtle reminder that our last hurricane was handled terribly, so this one must be too! Fox Nation is a cesspool…enough said. Number of Occupiers and Hollywood liberals that are helping with the relief effort: Too many to count. Number of “Patriots” who did anything other than accept funding and their insurance checks: Zero. And, once again… the whole country has taken notice. Well done post Chris Smith. “Some say” = Fux Noise slang for those little voices in Wrinkled Rupert’s head. ‘Some people’ agree that Fox exists merely to promote the economic interests of companies engaged in exploiting 1 billion Chinese wage slaves. One day If the USA plays its cards right , we too can offer up millions of wage slaves to the world market too. If you’re a disaster victim and someone offers you a hand, make sure it’s The Right Hand!! !